Britons are under-reporting their daily calorie consumption - potentially misleading policymakers attempting to curb obesity, research suggests. 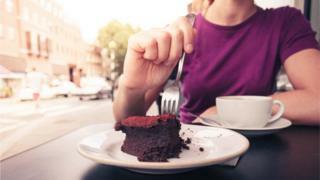 The Behavioural Insights Team points to scientific and economic data showing people eat 3,000 calories, compared to the 2,000 cited in official surveys. It says this could explain rising obesity levels, despite decades of surveys saying people are eating less. Government statisticians say the way calorie data is collated will change. Several official surveys, including the National Diet and Nutrition Survey and the Living Costs and Food Survey, suggest the amount of food people eat and buy has gone down in recent decades - while obesity rates continue to rise. But the researchers from the Behavioural Insights Team (BIT) say if the calorie counts in these surveys were correct, the UK population would be losing weight overall. The BIT is an independent company but started its life in 2010 as a government policy group known as the "nudge unit" because it was tasked with encouraging people into making better life choices. Its study points to scientific studies including chemical analysis of how much energy people burn, that show people are eating about 1,000 more calories a day per person than surveys would suggest. National spending figures also suggest we are buying more food than we report in surveys, the authors say. They suggest there could be many reasons people are not accurately reporting what they eat, including snacks being difficult to track, a desire to lose weight making them less likely to be honest about their eating habits, and fewer people taking part in the surveys overall. Low-fat or high-fat - does it matter? Is butter back and is sat fat good? Are diet drinks a no-go? Researchers also looked at the theory that a drop in physical activity was the main reason for rising weight gain. But they say if a reduction in exercise was solely responsible, every single adult nationally would need to have eliminated more than three-and-a-half hours of daily walking since the 1970s to account for the changes. They suggest policymakers trying to curb obesity should focus more on reducing calorie intake than promoting exercise. Media captionDo you know which of these contains the most calories? Lead researcher Michael Hallsworth, director of health at the BIT, said: "Anyone who has been on a treadmill will know what it feels like to look down and see you have burned far fewer calories than you expected. "Physical activity is good for your health and heart but reducing calories is a more effective strategy to combat obesity." Public health expert Prof Alan Maryon-Davis described the report as an "interesting and very soundly argued analysis". He added: "This will send a shudder through the junk-food industry. "Up until now they've been able to point to what was thought to be a decline in the nation's calorie intake and say there's really no need for tougher measures like a sugar tax, fat tax or calorie-labelling on alcoholic drinks. "But this latest analysis rather pulls the rug from under their feet." The Behavioural Insights Team, which is jointly owned by the UK government and charity Nesta, applies insights from academic research in behavioural economics and psychology to public policy and services.